Does your kitty like to scratch the couch? Callie is good at not scratching the couch since I've had her. But, my old cat liked to scratch our couch every morning. It's often frowned upon when a cat scratches the furniture, but if you provide your cat with other scratching options it can help. Made with durable and dense corrugated cardboard for sturdiness. Both a scratcher and a lounger. Made with style so it's not an eyesore in your home. Large enough for any size of house cat. Comes with a free bag of cat nip. Helps prevent your furniture from being scratched. Keeps your cats claws healthy. The Feline Be Mine Kitty Couch was created as an attempt to keep cats from scratching furniture. Living in a small apartment made it difficult for the creator, Joseph, to find cat furniture that could accommodate their needs. After considering declawing, he learned how painful this procedure is for cats and decided that it was not the best answer. (We agree!) The solution was the Feline Be Mine Kitty Couch. I've noticed that the cardboard cat scratcher also doubles as a great place for Callie to lounge, and for the past two weeks this is where she chooses to sit and sleep. Even my father commented on how much the cat likes her couch. I like that it is large enough for her to relax on easily with plenty of extra room. The Feline Be Mine Kitty Couch seems super durable and the cardboard is thick. I expect it to last for a very long time. I haven't caught Callie scratching on it too much, but she does every now and then. Mostly, she just enjoys sleeping on it. The catnip that came with the couch did not seem to have any effect on Callie that I could tell. I tried sprinkling some on the couch for her. I love the design of the couch - it's adorable! And the "arm rests" on the kitty couch seem to make for an excellent place for Callie to rest her head. Callie is definitely pleased with her new cardboard scratcher and so am I. She loves this thing! You can find the Kitty Couch by Feline Be Mine available for purchase on Amazon here. Would you like to try a Feline Be Mine Kitty Couch with your cats? 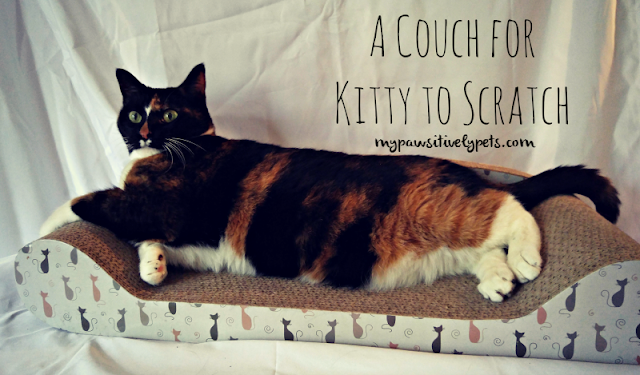 We are giving away one FREE couch cat scratcher to one lucky reader! The giveaway is open to the contiguous US (void where prohibited by law), ages 18+. To enter, simply fill out the Rafflecopter widget with as many entry options as you like. This giveaway ends on August 27, 2015 at midnight CST. Good luck! 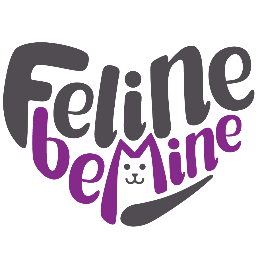 This post is sponsored by Feline Be Mine. 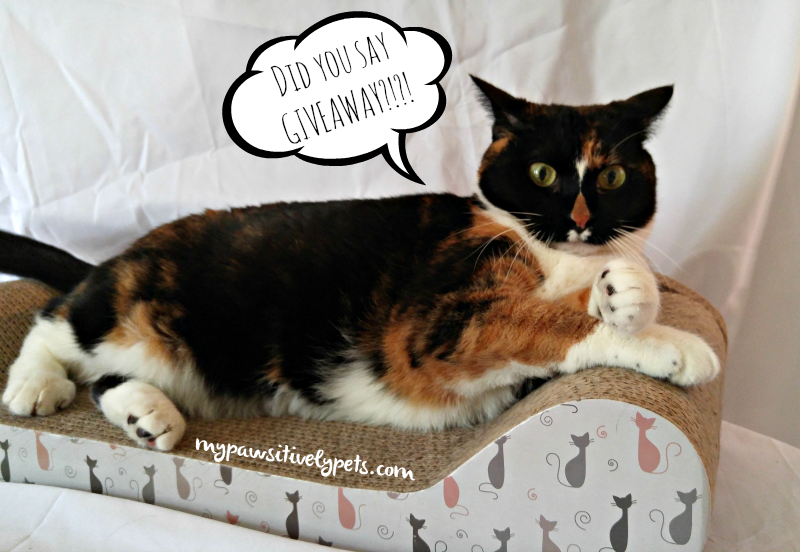 We are being compensated to help spread the word about Feline Be Mine's Kitty Couch, but Pawsitively Pets only shares information we feel is relevant to our readers. Feline Be Mine is not responsible for the content of this article. All opinions expressed here are our own. This post contains affiliate links. My kitties are real good at using scratching articles and not furniture, but they could use some more as the ones they have are wearing out. I would love this for my cats to stop them from tearing up the right side of the couch!!! love the size of this scratcher.....oh my Mocha would so love this! thank you for the chance! it does look darling and I happen to have one on the way, good luck to all who enter! I would like to win it because I know my kitty-boy would LOVE it! 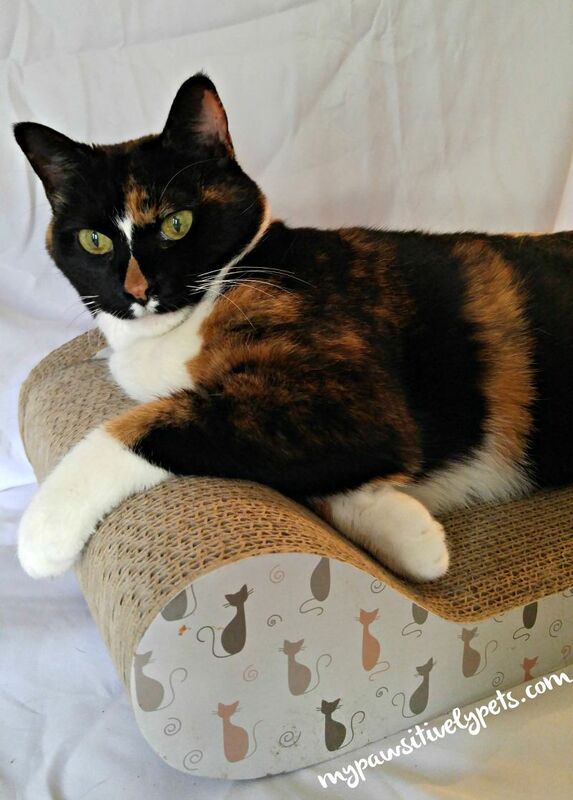 Callie is so pretty and clearly loves her couch! Kitties just seem to love cardboard scratchers and this one is so cute! That is a very nice couch! 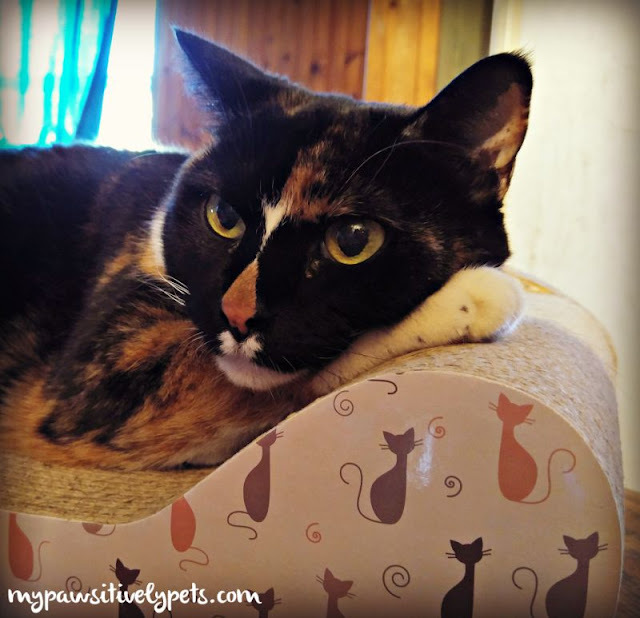 Lexy LOVES her lounger scratcher! We have two scratchers,so if we win we will donate to a shelter. That's a nice one! Those things are super popular here and we all, well those of us with claws, tear the heck out of them in no time! Our precious kitten would love new furniture. We LOVE thest types of scratcher loungers and would love to win this one. I so need to win this one my cat is scratching up my box spring and maybe this would stop her. Sneaky Pie and Mushu would love to scratch and lounge on it. They will feel like Kings! I don’t usually like cardboard scratchers but I like the shape of this one. Callie is a lucky cat. Our kitties would love this! They love cardboard scratchers and this one looks very cozy! Callie sure looks comfy on that! Sam doesn't scratch furniture, but she does scratch our pine walls - a lot. We've tried scratchers in the past but not for quite a while now. She might really like this since it's multi-purpose! I have several kitties that would love to scratch and rest on this couch. I'd love to try it becuse it'd be nice for my guys to scratch up their own couch, instead of mine! This is a great cat bed/scratcher! We have had one for a month now and it has held up really well to a fully clawed cat, heavy shedding and a couple hairballs. I vacuum it up and the hair is instantly removed, as well as any small bits pulled up by the scratching, and it is as sturdy and well liked by my cat as it was when we first put it by the window for her. It is her preferred sleeping spot in the house. I would love another to put upstairs for her as she is a senior kitty (18 years) and I know she would be happy to have a second favorite spot to sleep. We have 4 kitties, two of these, but I would love to donate this to our local animal shelter because they could really use it with their 36+ cats awaiting to be adopted. i dont have cats, but would like to win to donate to safe haven cat shelter and clinic, it would be nice for them to put in their local pet food bank. Does she use other scratchers at all? My cat is good about not tearing up furniture but she has to scratch the rug first thing every morning. She has scratchers, include a cat bed-shaped one, but doesn't seem to use them. She has one other scratcher, which is also a cardboard scratcher but a different kind/brand. She likes that one too. The only other thing I've seen her scratch is the walls, especially the cedar (I think?) ones in the bathroom. I don't see her do that since we've got her cardboard scratchers. Maybe she just prefers more of a woodsy type scratch? I think Mudpie would love a couch all her own! I like the design and I think my cats would really love it. Thanks for the chance. I'd like to try this for one of my two cats specifically. Right now I have a climbing tree that they scratch, but that really only has room to scratch vertically. My one prefers to scratch horizontally but I have not been able to get her something she likes so far that she would like. We'd love this couch in our house, we have a lot of kitties and we need all of the great scratching and lounging space we can get. We love the design! My four lounge lizards would love to recline and scratch on one of these! This is so cool. Thunder would love it! My one cat loves a couch her other one finally fell apart. She is 12 and born with defects and was abused so i think she deserves it. My cats old bed is done for, I think she would love to recline on this one. This is such a cool product! My kitties would love it! Our cats would love this - perfect size. And they could scratch away like crazy! My cats love scratch loungers! This one looks just perfect for them.